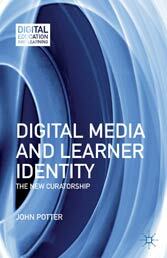 Digital Media and Learner Identity: the New Curatorship | D.A.R.E. John Potter’s new book Digital Media and Learner Identity: the New Curatorship was launched at the Institute of Education bookshop on December 11th. Many studies of digital education focus on technology rather than on the learners or on what they make and do with the devices they use every day. This book takes a different path, putting the learners and their lives at the heart of the narrative. Through an in-depth account of media production activities by younger learners it shows their motivations and dispositions in storying their identity in short video pieces. It suggests that their authoring and editing practices are examples of the new curatorship: the representation through life of identity and affiliation in digital media. It considers the implications of this for teaching and learning in the years to come and concludes with a manifesto for a future media education.